A significant step in the glass industry was made with the development of Pilkington Activ, the first dual-action self-cleaning glass. 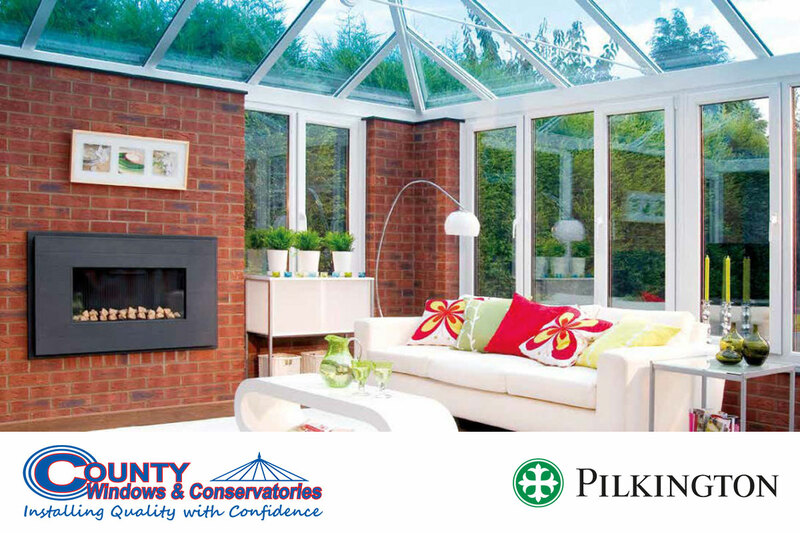 County Windows & Conservatories are pleased to offer this fantastic product in our conservatory roof glass installations. The unique dual-action of the Pilkington Activ coating uses the forces of nature to help keep the glass free from dirt, giving not only the practical benefit of less cleaning, but also clearer, better-looking windows. The Pilkington Activ Range includes products which benefit from both self-cleaning and solar control properties helping to create an environment that can be used all year round. Pilkington Activ Blue is an attractive blue glass that combines dual-action, self-cleaning properties with medium solar control performance helping to create a cooler internal environment which can be used all year round. Pilkington Activ Bronze is an alternative self-cleaning glass option to the popular blue-body tinted glass. Glass from the Pilkington Activ Range can be used in a variety of commercial and residential applications, including doors, windows, roof-lights, glass facades, conservatories and orangeries. Its self-cleaning properties make it ideal for use in hard-to-reach places that are difficult to clean. Stage 1 – The coating reacts with natural daylight to break down and loosen organic dirt. Stage 2 – When it rains, instead of forming droplets, the water spreads evenly over the surface of the glass, helping to wash away any dirt and reduce streaking. Why choose Pilkington Activ Self-cleaning Glass? The self-cleaning properties of Pilkington Activ reduce the need for manual cleaning, saving water and eliminating potentially harmful run-off from expensive detergents, also increasing personal safety. Pilkington Activ windows carry on cleaning themselves, even on rainy days and offer improved vision while raining, and afterwards.